BIGBANG Seungri Confirmed As Special MC for SBS Romance Package - This year is Seungri`s year on solo variety shows. He attend various variety shows, such as Knowing Brothers, I Live Alone and Radio Star. And recently, Seungri confirmed to be special MC on reality show Romance Package. Romance Package is a matchmaker reality shows for celebrity who looking for their couple by visiting various hotel. 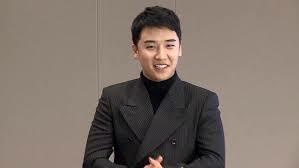 And Seungri will be an special MC after Jun Hyun Moo and Lim Soo Hyang leaving the show.